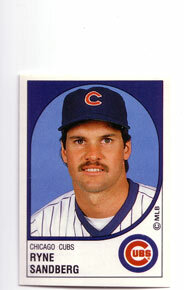 We all know that Ryne Sandberg is now a part of the Hall of Fame's class of 2005 (Ryne Sandberg and Wade Boggs). 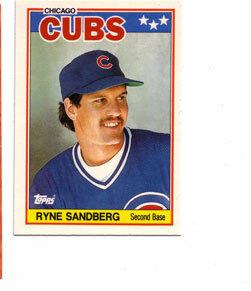 However, the looming question is whether or not Sandberg's bust will have a moustache. 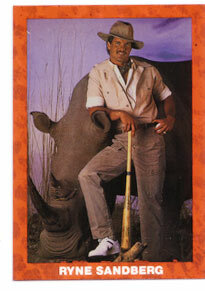 Remember in Spring Training of 1987 when he sported a moustache? 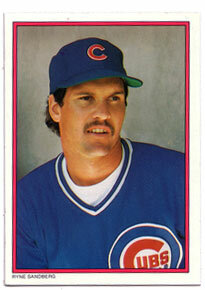 Let's hope to see Ryne Sandberg's moustache in Cooperstown! 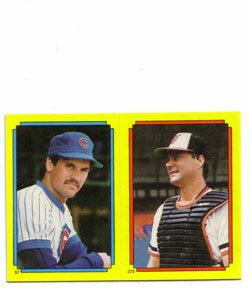 Below are some baseball cards from The 1987 Sandberg Moustache Experience. What's up with the cowboy outfit on the bottom middle card? Nice stone-washed black jeans, Ryno! At the very bottom is a close-up of the first card in the first row (1988 Panini Sticker). Maybe it's a good thing that Ryne shaved it off.